About 1 in 8 (12%) women in the US will develop invasive breast cancer during their lifetime. The American Cancer Society estimates about 231,840 new cases of invasive breast cancer will be diagnosed in 2015. Breast cancer can be separated into different types based on the way the cancer cells look under the microscope. Most breast cancers are carcinomas, a type of cancer that starts in the cells. In fact, breast cancers are most often a type of carcinoma called adenocarcinoma, which is carcinoma that starts in glandular tissue. Other types of cancers can occur in the breast, too, such as sarcomas, which start in the cells of muscle, fat, or connective tissue. Ductal carcinoma in situ (DCIS) is considered non-invasive or pre-invasive breast cancer. DCIS means that cells that line the ducts have changed to look like cancer cells. The difference between DCIS and invasive cancer is that the cells have not invaded through the walls of the ducts into the surrounding breast tissue. Because it hasn’t invaded, DCIS can’t spread (metastasize) outside the breast. DCIS is considered a pre-cancer because some cases can go on to become invasive cancers. About 1 in 5 new breast cancer cases will be DCIS. Nearly all women diagnosed at this early stage of breast cancer can be cured. Invasive ductal carcinoma (IDC) is the most common type of breast cancer. IDC starts in a milk duct of the breast, breaks through the wall of the duct, and grows into the fatty tissue of the breast. At this point, it may be able to metastasize to other parts of the body through the lymphatic system and bloodstream. 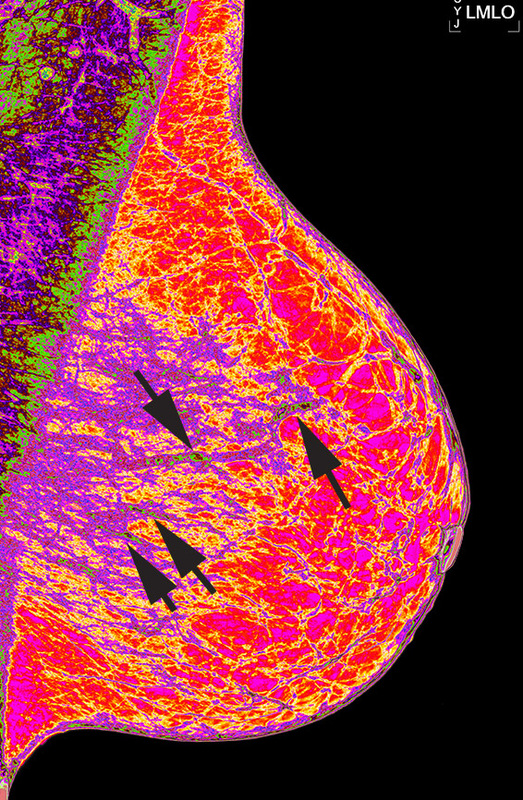 About 8 of 10 invasive breast cancers are infiltrating ductal carcinomas. 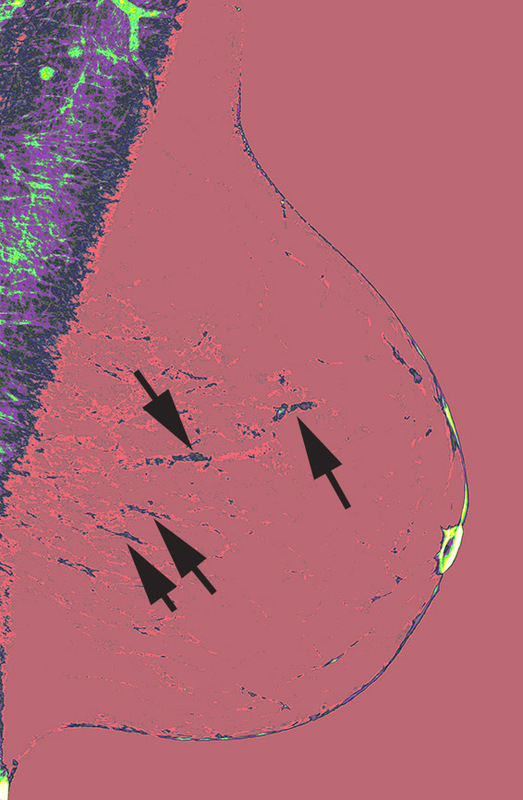 Invasive lobular carcinoma (ILC) starts in the milk-producing glands (lobules). Like IDC, it can metastasize to other parts of the body. About 1 in 10 invasive breast cancers is an ILC. Invasive lobular carcinoma may be harder to detect by a mammogram than invasive ductal carcinoma. On Tuesday, Tom Hanks’ wife Rita Wilson announced that she had been diagnosed with invasive lobular breast cancer and had undergone a bilateral mastectomy and breast reconstruction. In her published statement she explained that her first test for cancer came back negative (including 2 negative biopsies), but that she was correctly diagnosed after seeking a second opinion. Before the diagnosis, she had vigilantly monitored her health with mammograms and MRIs because she knew she had an underlying condition of lobular carcinoma in situ. Ms. Wilson’s profound statements about the need for a second opinion supports the strategic positioning of our breast cancer detection product, BCDx™, which we believe delivers a critical second look at the original generated mammogram, in ways never before seen by radiologists. Using BCDx™, the mammogram can be processed using sophisticated, proprietary image processing algorithms to generate enhanced observations of the underlying breast tissue. The sensitivity of the algorithms exposes the subtle changes that occur at the cellular level, thereby rendering conditions such as Atypical Hyperplasia and DCIS visible to the human eye. Additional quantitative data supports the visual presentation. BCDx™ delivers information that is not otherwise available to the decision-making process. Information is knowledge, and knowledge leads to more intelligent and confident decisions, which in turn leads to better patient outcomes. The earlier the diagnosis, the better the prognosis. We recently received a breast cancer case that exhibits characteristics similar to the progression of breast cancer in the Rita Wilson case. The woman’s cancer was diagnosed in 2014 (supported by both mammography and MRI results), and from our analysis originated from DCIS in 2010, the earliest images available for our analysis. We appreciate and thank this woman for her contribution to our technology and to future generations of woman for whom access to earlier detection will be a reality. The image on the left represents the application of the BCDx™ Color Mapping algorithm. Areas appearing as islands, outlined in green, display the structure and growth pattern of the cancer, and match identically to those areas indicated as cancer by the radiologist. This pattern consistently presents whenever cancer is present, whether as cells growing in a Petri dish, in a mammogram, or an MRI. 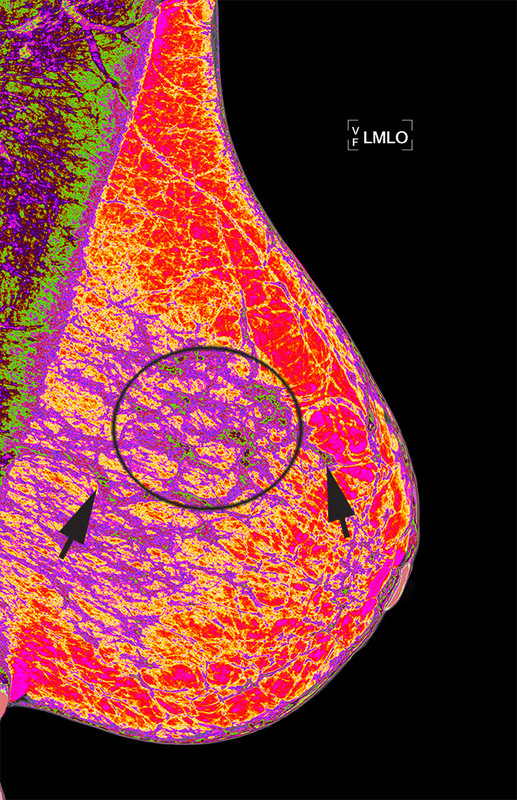 Using the M Intensity algorithm, the image on the right visually isolates the cancer structures and the penetration of the cancer through the duct walls into the healthy breast tissue. We continued to process her prior year’s mammograms to determine the earliest cancer onset that could be detected. In each year prior to 2014, our algorithms indicated the presence of cancer. While breast cancer was detected by BCDx™ in both breasts, in each of the years from 2010 to 2014, the condition known as DCIS was detected in 2010 in her left breast mammogram. Areas of cells lining one area of her ducts had become cancerous, but were contained within the duct and had not invaded into the surrounding healthy breast tissue. The image below was reviewed by her radiologist and the DCIS was overlooked. the existence of abnormal cells within the breast ducts. 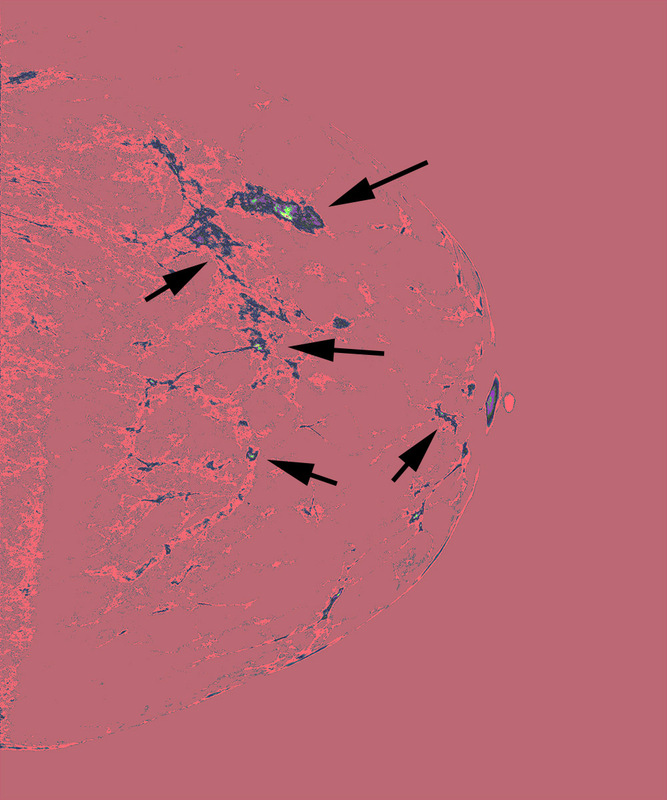 Arrows point to locations (corresponding to the radiologist findings of cancer in the 2014 mammogram) where the green “islands of cancer” indicate the presence of DCIS. Note the narrowness of the islands, an indication that the cancer had been contained within the ductal walls. 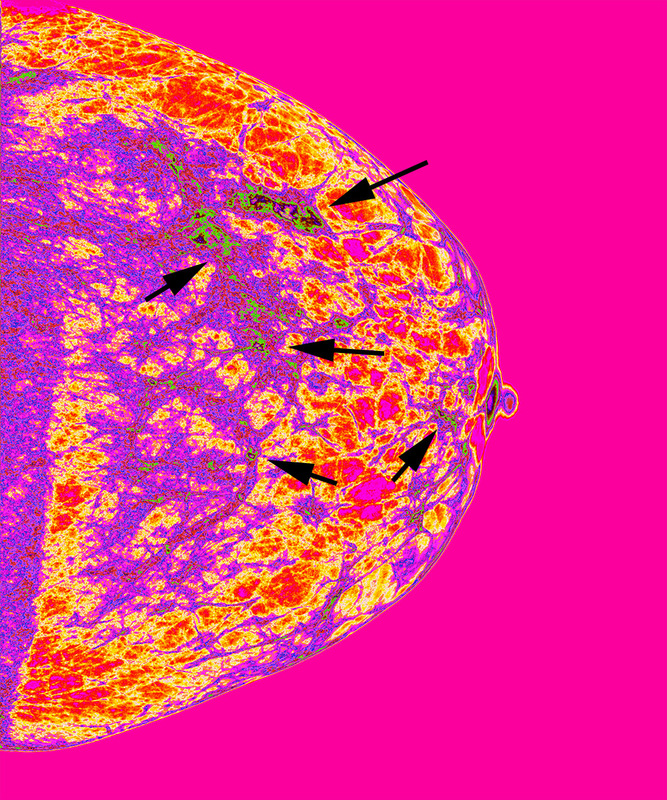 The image to the right is the 2011 mammogram processed using the Color Mapping algorithm. Note the progression of the cancer contained within the circled area. The cells are beginning to penetrate the ducts and invade healthy breast tissue. 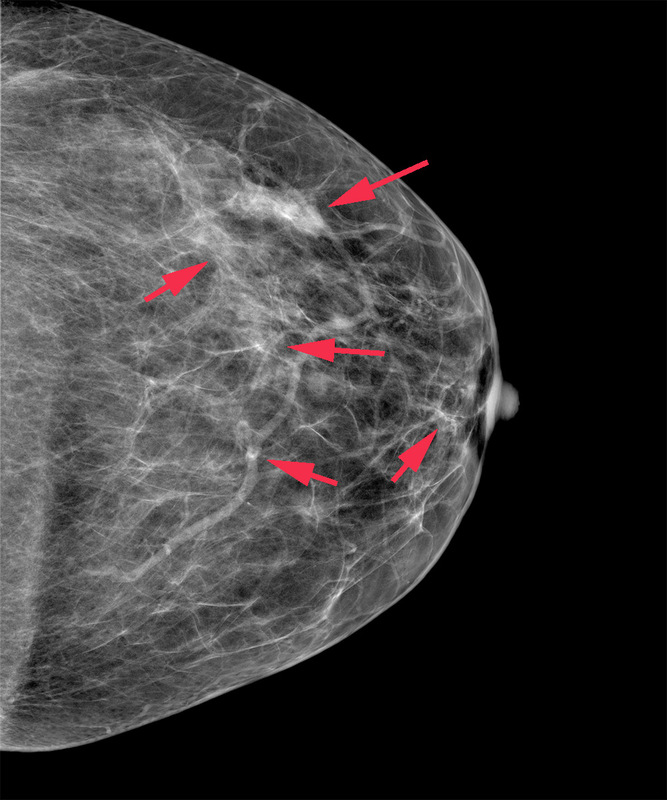 Numerous radiologists and clinicians have indicated that the ability to identify the presence of DCIS and Atypical Hyperplasia in standard 2D mammograms provides the earliest detection of breast cancer in radiology, regardless of the imaging modality employed, including those of 3D Tomosynthesis, ultrasound, and MRI scans. 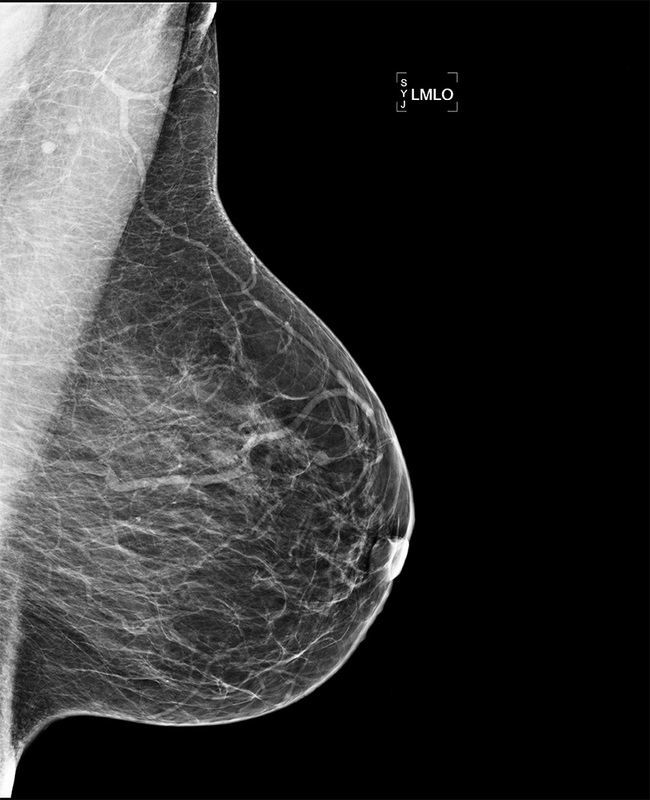 This entry was posted in Breast Cancer, Corporate, Healthcare, Mammography and tagged APVS, Atypical Hyperplasia, breast cancer detection, computer aided detection, computer vision diagnostics, DCIS, detection algorithms, digital image processing, mammography, Rita Wilson. Bookmark the permalink.